"Two bedrooms and a path." In the spring of 1885, five families traveled in a caravan of covered wagons to the Ashland, Kansas, area. One of these families included Henry Gardiner’s grandfather and grandmother. The Gardiners lived in a dugout for nine years on their 160 acres of homesteaded land where their son, Ralph, was born in 1889. Ralph Gardiner, Henry’s father, began putting together the present Gardiner Ranch in the 1920s. 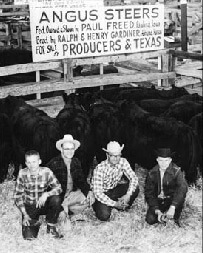 The ranch is now operated by Henry and Nan Gardiner, their three sons, Greg, Mark, and Garth, and their wives. As a family-owned seedstock operation, Gardiner Angus Ranch is totally dedicated to the production of quality beef from gate to plate. The Gardiners use their experience in beef cattle breeding, with state-of-the-art technology and data management, to produce Angus cattle that make unquestionable contributions to the beef cattle industry. As a family, they are optimistic about the beef industry and their role as seedstock breeders. “We are convinced that the next 115 years hold more potential for the Gardiner Family and other families in the beef business than the last 115 years. The beef business has never had as much opportunity for profit as it does today,” Mark Gardiner says.